The Therabath PRO Professional Grade Paraffin Bath provides intensive moisture therapy, that nourishes skin and penetrates heat. It soothes aching joints, relaxes stiff muscles, relieves work-weary hands, and eases arthritis and tendinitis pain. The larger, full-sized inner tank is large enough to accommodates hands, feet, and elbows, yet the unit is so compact it fits on a counter top. handles for portability. The worry-free, automatic thermostat maintains medically prescribed temperature eliminating risk of exposure to extreme heat. Surfaces remain cool to the touch and extra insulation results in energy efficiency permitting 24 hour operation. Includes 6 lbs. of triple filtered therapeutic paraffin. Paraffin wax has a very high heat capacity, meaning it is able to absorb and retain a great amount of heat. A paraffin wax spa takes advantage of paraffin's heat-retaining capacity in a simple process called heat transfer. In technical terms, heat is transferred to the core of the affected area as paraffin goes through a phase change. As it melts, the paraffin becomes a liquid and is able to retain more heat. Then, when a hand, foot, or other area is dipped into the heated bath, the phase of the paraffin that surrounds the dipped area quickly changes into a solid. The heat that is given off is called the heat of fusion. More simply, the heat that goes into melting the paraffin comes out when it solidifies into a comforting paraffin coating, thus transferring the heat into the affected limb. Another way to look at it is the paraffin is the medium that transfers heat from the TherabathPRO to the painful area. Can Therabath's Moist Heat Therapy Help My Pain And Stiffness? Can Therabath Help My Dry Skin? TherabathPRO warm paraffin wax treatments are fast-acting, drug-free, and versatile, providing heat therapy for many different applications from arthritis joint pain relief to salon hand, foot, and facial services. Please Note: Consult your physician if you have questions about any Therabath heat therapy product. The Original, and Still the Best! Compare the TherabathPRO with any other paraffin bath. You'll see why we say "Don't Accept Imitations!" Unsurpassed 5 Year Warranty: Manufactured to be the best paraffin bath available. Worry-Free, Safe Melting: Slow, even melting. No temperature-setting dial means you don't have to worry whether the paraffin is too hot. Professional Quality Construction: Made to healthcare standards and available to everyone! Made in the USA: Manufactured under strict quality control procedures. Automatic, Precise Temperature Control: Thermostatic control keeps the paraffin at the optimum temperature for maximum benefit. Automatic On/Off System: Indicated by the light on the outside, which automatically turns on and off. Individually Tested: Each unit is tested before it leaves our factory. To make sure the customer gets the highest quality. Full-sized Inner Tank, Compact Outer Tank: Accommodates hands, feet, and elbows yet is small enough to fit on a counter top. Safety Built In: Inside and outside surfaces remain cool to touch because of special construction and extra insulation. Long-life Heating Elements: Provide even heating for better temperature control. Energy Efficient: Costs pennies per day to operate. Designed to be left on continuously so the paraffin is ready for use. Laboratory Tested: Assures that the paraffin is germ free during operation. Rounded Ends: Gently curved ends provide more comfortable dipping. Easily Portable: With built-in handles. Essential Oils: Essential oils such as tea tree, peppermint, lavender, and eucalyptus may be used to add an aromatherapeutic element to paraffin treatments. CE Marked and CETL Listed for Quality and Safety: To ensure reliable, safe operation. Paraffin Quality that is Crystal Clear: Packed with 6 lbs. (2.72 kg.) triple-filtered paraffin. Durable, Attractive Exterior: Won't discolor with use, is easy to clean, classic styling fits any decor, & measures 14.25" x 8.5" x 7.75" (Inner Dimensions: 12.9" x 6.75" x 5"). Effective. Good Value. Safe. Sturdy. Men. Everyday. Women. Daily Use. The heat soothes your joints while the wax moisturizes the skin. Excellent, safe way to beat the damage and pain the winter months inflict on your hands and feet. Easy to use. Good Smell. Good Value. Effective. My father has arthritis and the pain has kept him up at night. Using the paraffin bath daily has allowed him to be more pain free and sleep through the night. Sturdy. Lightweight. Good Value. Effective. Well constructed, melts 6lbs of wax in less than 2hrs, can leave on 24/7. I use this product at night...calms the arthritis in my hands down and helps me rest better...the warmth of the wax feels great! Sturdy. Safe. Good Value. Effective. 24/7 no waiting to use. Good temperature of wax. Daily Use. Arthritis. Chrinic Pian. Chronic Pian. Chronic Pain. Everyday. This unit is to replace a professional grade paraffin bath that I had for 15 years and cost much more than this one. I have had this one for 1 month and am very happy with it. I'm a plumbing contractor, work in a cold climate and have a lot of arthritis in my hands and wrists. Using this item allows me to continue working as it eases the pain and keeps the joints mobile. Well worth the investment. One reviewer stated, “I use this in my massage studio, leaving it on all the time so it is ready for any client who requests or needs it.” Another reviewer stated, “I moisturize my hands and feet with cream and cover hands and feet with plastic liners.” So, if I understand correctly, the same wax is kept heating in the Therabath Unit as long as needed and to remain free of contaminates the individuals use gloves when placing their hands and/or feet into the hot wax. Is this correct? I have had the hot wax in physical therapy many times. You wash hands (or other body part) dry well and dip 4-6 times. Let each coat dry a bit. Then put on plastic liners and terrycloth gloves. Relax 15-20 mins and enjoy. The you can pull the whole wax coating off in the bag and reuse. Soothing for arthritis and moisturizing. I want to use it daily for hands & feet [i might even try to wax my shoulder]. 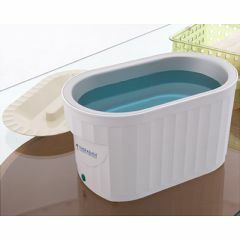 What other supplies are needed with use of the Therabath? I know I will need to purchase more wax as someone said they have used it only 3xs and already need to buy more. *When used in PT they used the glove warmers as well as warm towels on me. I do know the gloves are very comforting but Are the warmers essential or, just as effective to use only a warm towel? One reviewer stated, " moisturize hands and feet with cream and dip 5 times. cover hands and feet with plastic liners and mitts and booties for 30 minutes". So my question is about these liners. I have not seen any info on hand & feet liners though I did see liners for the Unit and I did see warmer mitts. Are the individual hand and foot liners used in PT so the therapist are able to keep the same wax all day? We are shown 3 vessels each with different description? Please advise. Does the warranty cover peeling of the most outer covering of paint or whatever is on the outside? How long does it take to melt the wax (some machines say 120 minutes!)? What do you do with the melted wax when you're done? Can you add your own scent, I'm not fond of wintergreen.